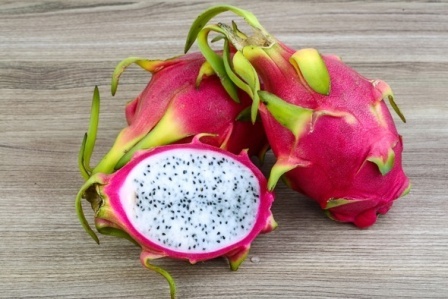 Dragon fruit is native to Central America, South America and West Indies. This fruit, however, emerged only a few decades ago as miracle cactus for commercial cultivation in many countries. The outer skin of this fruit is cactus-like, resembling that of the scales of a mythical dragon. That is the reason it has been given the name, dragon fruit. Dragon fruit has arrived in India quite recently and has been introduced around Pune in Maharashtra State. 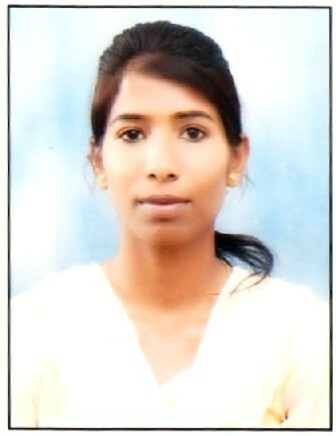 It is fetching a very good price in the market. Plants clambering or sprawling, upto 3.5 m tall.. Stems deep green, joints 20-50 × 3-8(-12) cm, winged or angled, margins of wings or angles coarsely crenate, horny. Areoles 3-6 cm apart, 2-5 mm in diam. Spines 1-3(-6) per areole, spreading in various directions, gray-brown, conic to subulate, 2-5(-10) mm. Flowers 25-30 × 15-34 cm. Receptacle tube funnelform. Sepaloids with greenish midrib and mostly white margin, lanceolate-linear to linear, 10-15 × 1-1.5 cm, margin entire, apex acuminate, reflexed. Petaloids erect to spreading, white, narrowly oblanceolate, margin entire or erose. Filaments cream, 5-7.5 cm; anthers linear, ca. 4.5 mm. Style cream, 14-20 cm, stout; stigmas 20-24, exserted, 2-2.3 mm, slender. Fruit red, globose to ellipsoid, 7-12.5 × 6-12 cm, 150-600 g, with numerous triangular scales, umbilicus small; pulp white. Seeds obovate, ca. 2 × 1 mm. eaten fresh. The fruits are also used for making juice, sherbet, syrup, jam, jelly, preserve, candy, and wine, flavouring drink, ice cream and pastries. In Taiwan, the unopened flowers are cooked and eaten. These are also used for preparing tea. Fruit skin is potential source of fibre with anti-radical activity. 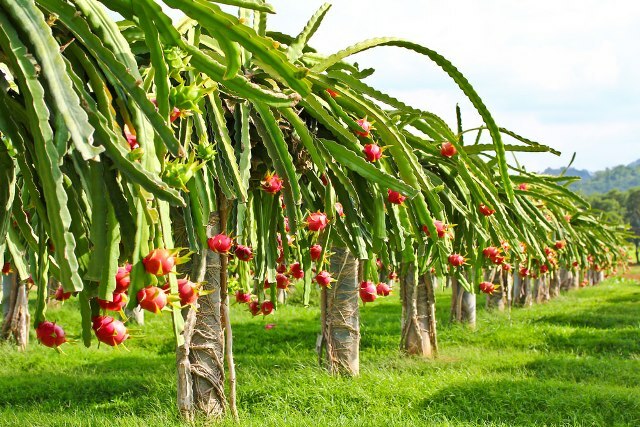 Well drained soil with high organic matter is suitable for the cultivation of dragon fruit. It prefers slightly acidic soil. Plants grow well in dry tropical and subtropical climate. It requires sunlight or semi shade condition. It grows up to the mean sea level up to 2700 m and requires annual rainfall of 600-1300 mm. The optimum temperature for cultivation is 35-45o C. Plants tolerate up to 45o C. Temperature should not be less than 10o C in winter. It is sensitive to water logging. It is propagated through stem cuttings. Stem cuttings of 10-40 cm are cut dried for a week before planting. Stem cuttings are planted at spacing of 3-4 m to 3-4 m. Seeds can also be used for propagation. The ideal temperature for germination is 18-21o C. It takes 15-20 days for seeds to germinate. Dragon fruit plants require support and some sort of trellising has to be done. Main stem is made to climb concrete or wooden pillars, fences, walls and trees. After planting, main branch is allowed and lateral branches should be trained till it reaches top of the pillar. Once it reaches, tip of the stem is to be removed to encourage lateral branches. Over grown branches, dead and diseased stems, should be removed periodically. Since it is a shallow rooted crop, so it requires proper fertigation. Watering should be done on regular basis from March to August. Watering is given once in week during August to Janurary. It is stopped from Janurary to Febrauray to aid flower induction. After flower formation, water should be given regularly. Asexually propagated plants produce fruits within 1-2 year of planting. Commercial yield start within 5 years. Flowering occurs during July-September. Fruits can be harvested from September to December. Changes from green fruit to pink red with green scales is the right stage of harvesting. It takes 50-60 days from flowering to peak ripening. Fruits can be stored at 10o C for 35-40 days.